"Arming You With Some Facts". First thing - Do not put on a tire with a P as the first number. Example P225/60R16 - These are Passenger car tires!!! Most tire shops have a rack they go to when they sell used tires. Junk yards too... You'll just need to figure out how to read the tire code info so you don't wind up with a tire that looks good, but is older than the ones you've got on there now. 3902: 39th week of 2002. A three digit code was used for tires manufactured before 2000. Example of one: 379 means it was manufactured in the 37th week of the 9th year from that decade. In this case it means 1989 or 1979 or ???. Tires manufactured in the 1990s, the same sequence, but now there's a triangle Δ after the DOT code. So, a tire manufactured in the 37th week of 1999 would have the code 379Δ. From 2000 on the 4 digit code is like above. Same rules apply. So, for example: 2701 means the tire manufacture date is... 27th week of 2001. I copied everything below from a site that I am a reluctant fundraiser for... www.nhtsa.gov - seeing that I, and the rest of you paid for this info, I have no problems with copying their work. This three-digit number gives the width in millimeters of the tire from sidewall edge to sidewall edge. In general, the larger the number, the wider the tire. This two-digit number, known as the aspect ratio, gives the tire's ratio of height to width. Numbers of 70 or lower indicate a short sidewall for improved steering response and better overall handling on dry pavement. The "R" stands for radial. Radial ply construction of tires has been the industry standard for the past 20 years. This two-digit number is the wheel or rim diameter in inches. If you change your wheel size, you will have to purchase new tires to match the new wheel diameter. This two- or three-digit number is the tire's load index. It is a measurement of how much weight each tire can support. You may find this information in your owner's manual. If not, contact a local tire dealer. 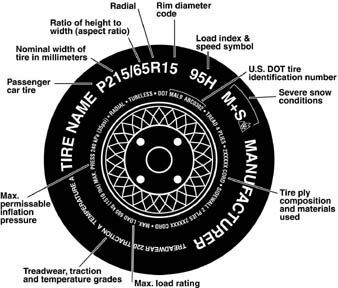 Note: You may not find this information on all tires because it is not required by law. The speed rating denotes the speed at which a tire is designed to be driven for extended periods of time. The ratings range from 99 miles per hour (mph) to 186 mph. These ratings are listed below. Note: You may not find this information on all tires because it is not required by law. * For tires with a maximum speed capability over 149 mph, tire manufacturers sometimes use the letters ZR. For those with a maximum speed capability over 186 mph, tire manufacturers always use the letters ZR. This begins with the letters "DOT" and indicates that the tire meets all federal standards. The next two numbers or letters are the plant code where it was manufactured, and the last four numbers represent the week and year the tire was built. For example, the numbers 3197 means the 31st week of 1997. The other numbers are marketing codes used at the manufacturer's discretion. This information is used to contact consumers if a tire defect requires a recall. This number indicates the tire's wear rate. The higher the treadwear number is, the longer it should take for the tread to wear down. For example, a tire graded 400 should last twice as long as a tire graded 200. This letter indicates a tire's ability to stop on wet pavement. A higher graded tire should allow you to stop your car on wet roads in a shorter distance than a tire with a lower grade. Traction is graded from highest to lowest as "AA","A", "B", and "C". This letter indicates a tire's resistance to heat. The temperature grade is for a tire that is inflated properly and not overloaded. Excessive speed, underinflation or excessive loading, either separately or in combination, can cause heat build-up and possible tire failure. From highest to lowest, a tire's resistance to heat is graded as "A", "B", or "C". Tires for light trucks have other markings besides those found on the sidewalls of passenger tires. The "LT" indicates the tire is for light trucks. This information indicates the maximum load and tire pressure when the tire is used as a dual, that is, when four tires are put on each rear axle (a total of six or more tires on the vehicle). This information indicates the maximum load and tire pressure when the tire is used as a single. This information identifies the tire's load-carrying capabilities and its inflation limits. In some heavy snow areas, local governments may require true snow tires, those with very deeply cut tread. These tires should only be used in pairs or placed on all four wheels. Make sure you purchase snow tires that are the same size and construction type as the other tires on your vehicle. 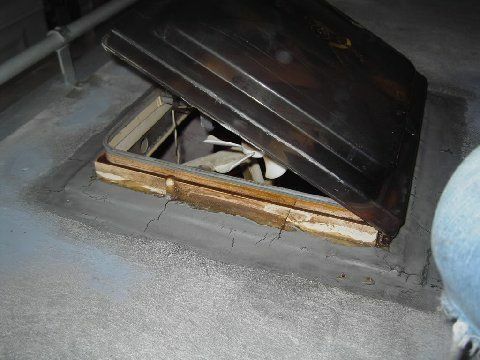 Going to Seal Your Roof? 1.Clean roof with dawn soap & clorox & stiff brush. I had a broom handle & a scrub brush attached. Rusty used "Purple Power". The dawn & clorox were on hand so that is what I used. Probably 3 or 4 scrubbings & rinsings. 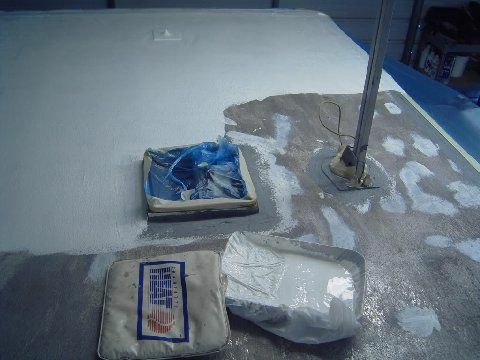 2)Take a firm wire or hard plastic brush & a 1 1/2" wide putty knife & “remove all mildew, dirt, rust, loose coating or other contaminants which would prevent maximum adhesion of the Anvil roof coating”. I used a paint removing tool & in some spots I put all I had into scraping down to aluminum. The seal around some of the rivets had deteriorated & was loose but not too loose. I used a lot of elbow grease getting around these rivets because I didn't want it to haunt me in the future. There were some rivets that were worn out & need to be replaced or just not there. Drill them out & replace. Aluminum w/aluminum mandrels. I have what you need if you want me to send you some. Rivet tool is under $25. 4)Buy some spray on self etching primer “SMS” @ NAPA. Take a rough grade of Scotch Brite pad (NAPA) & scuff up the aluminum that is now exposed & apply primer to any bare aluminum. 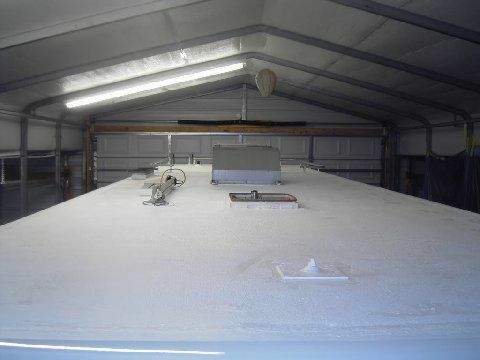 a)After I primed the bare aluminum spots(gray self etching primer)I let it dry then went over primed spots with a coat of anvil before rolling whole roof. 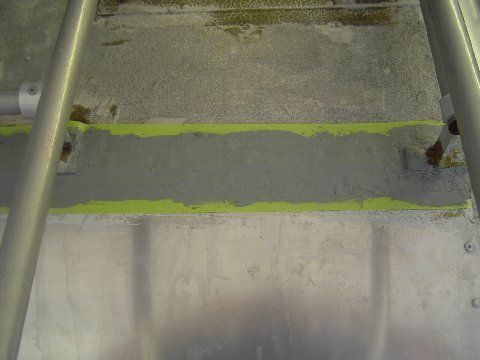 5)Buy Grey Seam sealer in quart can (NAPA brand) It is for sealing seals of semi truck trailers. Note: The first can was easier to apply than the second one because it was thinner. This was a little frustrating. 6)I taped off the perimeter of the roof for neat lines. 2” left of seam & 2” right of seam. * The seam itself had the most sealer & I tapered off to the edges for a convex application. I was being much neater than original application because I was going to paint just up against the roof so I taped my lines. I would recommend anyway. a) If there was any roofing material or sealant I could not manually remove with some serious elbow grease I decided not to remove it. I figured if it had managed to survive 25 yrs it would make it another 25 with new sealer on top of that. The more the merrier. Apply thick. 1/4". If you tape it give it about an hour to cure & remove the tape. Slope away from the vents so water will flow off. 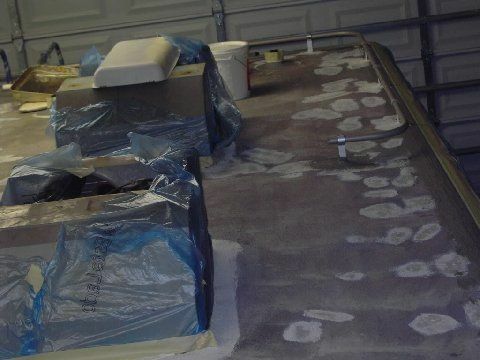 7)I took some self leveling product; dicor self leveling sealant, “painted” thin coat with a brush over the DRY gray seam sealer vent openings, roof rack anchors, and old covered air horn hole. I did this after the 1st coat of Anvil. This was probably over kill. I did this so I could get down into the cracks & seals that the firmer gray sealer may have missed. 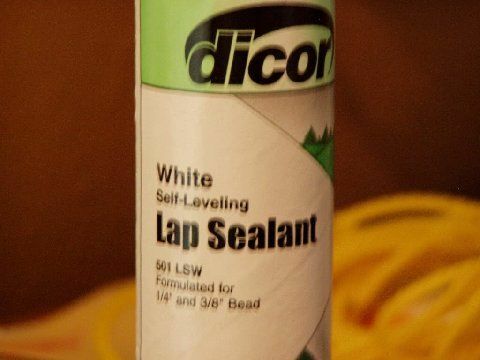 I did not go over the perimeter seams with this product. Let dicor dry thouroughly before 2nd coat of Anvil. Day or so. 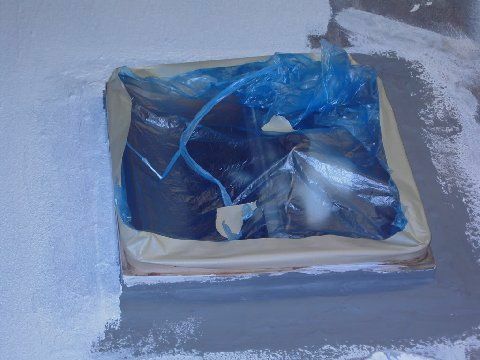 8)Call Sherwin Williams & ask them to special order a gallon of bright white Anvil multi-purpose Elastomeric Roof Coating. It is about $35. 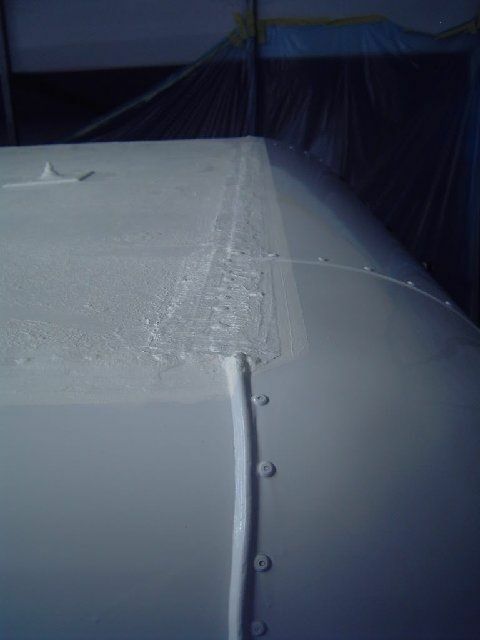 Paint your vent seams & roof edges with a paint brush & roll on the rest. It goes on like a dream. I put on two coats & still have some left over. Depending on the temp & humidity will determine the drying rate. Ideal conditions temp above 70* & 50% or less humidity. If conditions are favorable coat once wait 2 hrs & recoat. If you have a hot sunny day or two or three park in sun & allow to really dry. Our weather was extremely humid & it took a month for it to dry. Wear white soled shoes, the black soled tennis shoes leave foot prints. 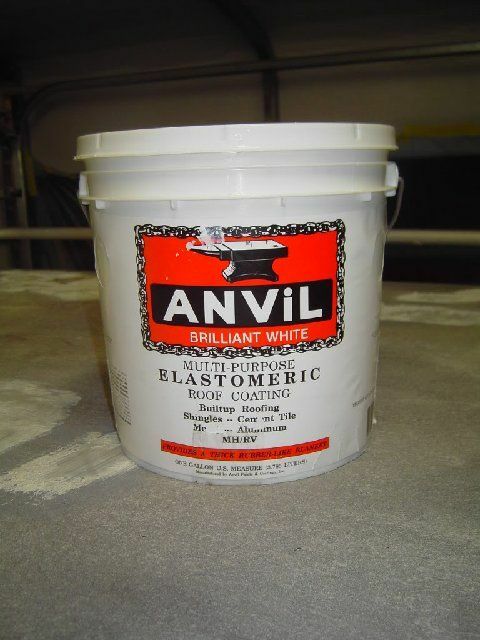 9)Anvil Paints & Coatings, Inc. 1255 Starkey Road Largo, FL Anvil makes a seam sealer but I didn't know that until I had already done all of my sealing. Don't know anything about their product. Some of my applications were not recommended by dicor company. 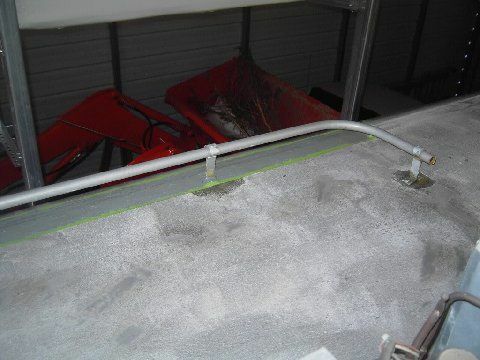 Applying elastomeric to dicor not recommended. We'll see. 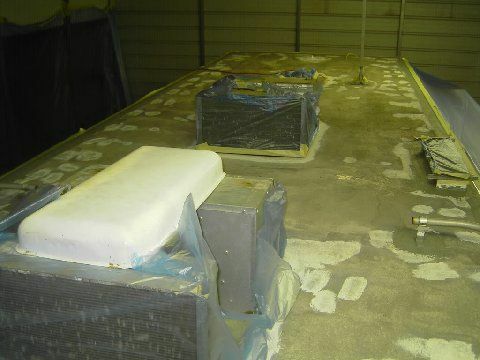 10)Barth originally used Anvil on it's roof application. Someone added sand to it. I checked into this & Anvil did not recommend it. I painted over the original application without sand because most of the sand remained on my roof. 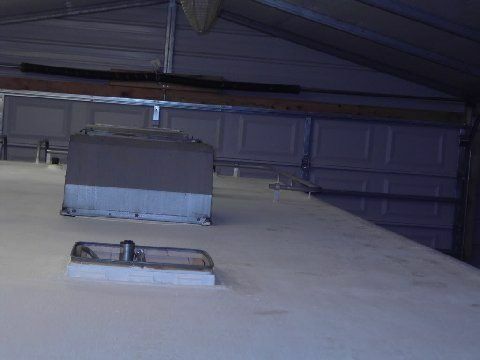 If you have a smooth aluminum roof I would suggest some sand but make sure it is clean sand check for chemical reactions. This project involved removing a Moen faucet that was mounted in a Moen double bowl sink and replacing it with a newer style Moen Camerist CA7825CSL faucet. Both the new and old faucets mount in a single hole on the flange of the sink. I meant to take photos of this project, but forgot the camera and didn't have the time to go back to get it. After finishing the job I realized that if I just told you what took place you would understand everything as you went along with this if you did it yourself. Removing the sink: Disconnect your water lines. Make sure you mark hot and cold lines for proper re-attachment. Disconnect your drain lines from the sink bowls. Now for the fun part. You have channels mounted around the perimeter of the sink under the counter top. You can see these by looking up to the bottom of the sink from the cabinet under the sink. These channels should have 10-12 clips that are in the rails at different points under the sink. There should be at least two at 90 degress at each corner and then one each at half way down each side. These clips have small screws that thread through the middle of the clips and are used to tighen down the sink to the counter top. This is where it gets a little tricky because you need to loosen all those clips and slide them out of the channels at either end of the channel. Patience is needed here, as some are a bit tricky to get to. Once all the clips are removed you can now lift the sink out of the counter. After removing the sink we found it to be MUCH easier to remove the nut from the shank of the old faucet. You can easily get wrenches on it now. Ours had some thread damage on the shank along with some corrosion issues that made it basically impossible to get the nut off the shank. We ended up cutting it off. Here is where the new faucet compared to the old faucet meant making alterations. When we pulled the old faucet from the sink we found that the faucet had been matched up to the sink by way of two flat edges on both the shank and the hole in the flange. The new faucet has a 360 degree round shank. Add to that, the hole in the sink flange was about 1/8" too small for the new shank. And I already knew that when the new faucet was mounted in the hole that was there, it was possible there was going to be about an 1/8" overhang on the rear sink flange. So we planned to kill two birds with one stone. We decided we would "round out" the flat sides of the opening and at the same time move the hole opening closer to the bowls of the sink. So with files, grinding stones and lots of trial "fittings" of the new faucet, we did this. Once we got the hole opening larger and closer, we then mounted the new faucet, per the directions, into the sink flange. Looked good at that point. We then went to drop the sink back into the opening to make sure everything fits and found that because of the new location of the hole along with the larger nut on the larger shank, it hit on the back edge of the opening and the flange would not lay flat on the counter top. Pulled the sink and enlarged the "cut out" on the back edge of the counter top. Now the sink fit properly. We penciled the outline of the sink flange all the way around the sink while it was sitting in the opening. 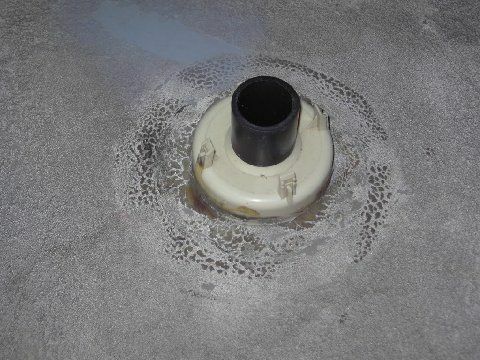 We removed the sink and then took some clear silicone and put a large bead around the inside of the line and did the same all the way around the flange of the sink. We then put the sink back into the opening and then proceded to reinstall the 12 clips we had removed by sliding them back into the channels and tighening them in place. The sink was now reinstalled. We had to get adapters to hook up the water feeds, as we had female connections on both the water feeds and faucet flex hose connections. You can pick them up at Home Depot or Lowes. Then we re-attached the drains and we were done. Oh, and another NOTE: It was much easier doing this with at least two people. 1) Does the fluid (on the stick) look burned, i.e. brown or ugly-dark-red? Does it smell "burned"? If so, it has been too hot and must be changed. 2) First thing, even if it appears okay: go to Pep Boys and buy a new filter & Dexron fluid. SHADETREE MECHANICS STOP READING! You have a Turbo400 trans -as opposed to a (passenger car) Turbo350- and it has no drain plug, so loosen about a dozen small bolts from around the outside flange of the xmiss pan, break the gasket seal with a small screwdriver between the flange and body, and tilt the pan to drain the fluid into the catch container you've placed underneath (splashing smelly fluid all over yourself). Remove all bolts, then remove the pan. The filter is a flat, thin aluminum-framed thing about 8X10", held up by one small bolt near the front. Remove the bolt, then the filter by pulling it down. A 1"dia tube extends from the front of the filter up into the trans; pull it down and out if it doesn't come off with the filter. Now (important): stick your finger up into the receiver hole the tube came out of and remove any O-rings left in there. The new filter will have a new O-ring for the upper tube neck to seal it, and often the old ring will remain in the cavity (in a 20-year old trans, maybe 2 or 3) when the tube is removed. Clean the flange face on the body and on the pan. 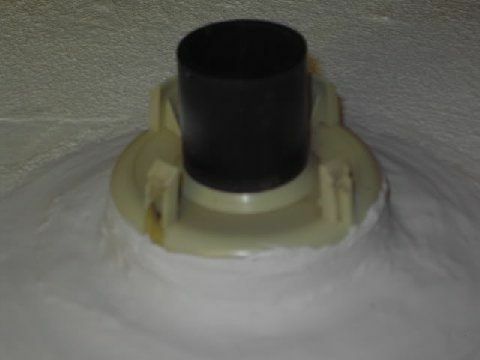 Install the new tube with O-ring, then the filter by inserting the one bolt through it into the body; place the new neoprene gasket on the pan, held in place by a LIGHT coating of gasket sealer; hold the gasket in place by pushing bolts through the pan holes into the gasket while sealer dries; then place the pan on the body and screw in the bolts. Don't overtighten, as the body is aluminum. Fill with new Dexron, drive until operating temperature is reached and check fluid level. It's real easy to change fluid/filter - about like an oil change. Next: Your trans fluid circulates through the radiator. Probably has two stainless 1/4" lines entering and leaving the radiator on the rear face, on the passenger side, high and low. You may wish to unscrew them one at a time (carefully! ), start the engine, and see if fluid is circulating. Sometimes one of these becomes crimped (usually up close to the trans where you can't get to it) and fluid circulates slowly or not at all. You can see both these lines from beneath the engine. The trans cooler lines like to rub on each other or the clips can wear the lines. Check for wear along their full length. What is the exact translation the ancient tire designation : 7.5X16 to the modern metric i.e 225/75R16 or whatever ? is there a conversion chart somewhere? Page 3 of this doc has a chart.